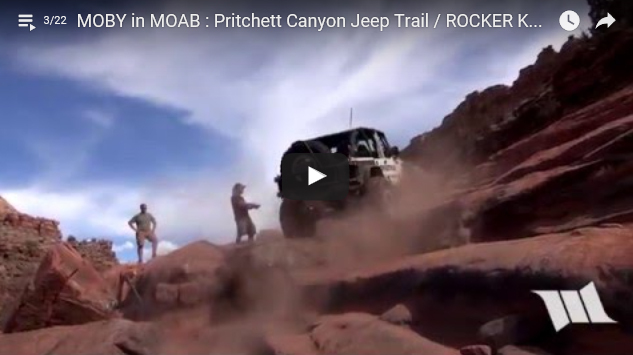 Rocker Knocker is without question one of the most famous obstacles on the Pritchett Canyon Jeep Trail in Moab, Utah. Essentially a huge set of ledges with a sandy base to make things slick, this obstacle typically requires big horse power or a careful line that will push your Jeep to the edge of flopping on its side. Because of its difficulty, a winch point is located up on top and it isn’t uncommon to see broken parts laying around. In this short clip, you’ll get to see two different camera views of Cindy taking on this formidable challenge in Moby, our 2007 Jeep JK Wrangler powered by a 6.2L LS V8 and pushing 40″ Toyo MT’s. A BIG THANKS goes to our good friend Tony (JeepFan) for helping us to make this clip possible. We hope you enjoy.